April 28. 2017 – GASTON J. GLOCK style LP is proud to announce Dave Sevigny’s Production win at the USPSA Area 6 Championship. The regional pistol tournament was held at South River Gun Club in Covington, Georgia. 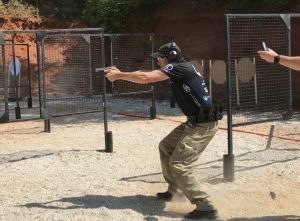 Over 600 shooters competed at Area 6, making it one of the largest USPSA events held this year. The Production division was the deepest field, consisting of 179 competitors, including over a dozen grand masters. “Area 6 is a match that always has plenty of top competitors. I’m happy to have won it again this year,” said Dave. This is his 9th win at the USPSA Area 6 Championship. “Dave trains hard to compete against the best and his extreme discipline helps with his continued success. It proves that he is one of the most accomplished shooters in the world”, said GASTON CEO Beate Arnold. The next major match for Dave Sevigny will be the World Steel Challenge Championship held in San Louis Obispo, California, May 4-6, 2017. Dave Sevigny is a 13-Time USPSA National Champion including 6 wins in Production.